How did the Red Glasses happen ? In 1995, I was living in New York running my business of graphic arts: Power Color. I had been wearing reading glasses for a few years and was very unhappy with the half glasses or the Armani glasses that I was wearing. During a dinner, I met Selima. She had 2 very young children and had opened the first optic store in Soho a year ago. I talked with her about my dilemna. I just need reading glasses but they are never with me. Either they are on my desk when I am in the view booth or they are in the computer room when I come back at my desk. "I wish I could find a pair of glasses that I would put on my nose in the morning when I wake up and I would keep them there until I go to sleep". Selima was looking at me and said "Give me a few days and I may have something for you! I came to her store on Wooster, she was all smiles and said "Look, I designed these glasses for you, what do you think?" and she put these red glasses on my nose. I loved them instantly, I found them witty, it had character, guts and it was very functional and fun. Finally, a pair of glasses I could keep on my nose all day long. She was so happy to see my excitement that she told me if you wear them everyday, I will name them "Hubert". And so we did. On the inside of the glasses is engraved Hubert. For my birthday that year, Selima offered me 6 more pairs of the same glasses but in different colors. Like that you can wear one color everyday of the week. I did that but I was always coming back to the red glasses, they were more fun than any other color. They become my "Trade Mark". In all the graphic materials of Power Color as well as later on my business cards as a real estate broker at Douglas Elliman in Manhattan was a photo of the red glasses with my name underneath. 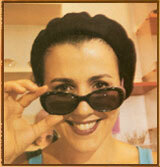 Selima became very successful, (not because of me) she opened up 12 stores in Paris, New York, Los Angeles and Tokyo. Every so often I get in trouble by breaking my glasses or losing them. Selima always comes to the rescue, the last time was this Christmas (2008) when I was wearing my black glasses since the Red ones broke one night in Texas on my way back from South America. - People I don't really know that I did not see for years would tell me "I know you!" - In Manhattan 2 or 3 times a day (every day) a woman would tell me "I love your glasses!" - They are very practical for me because they are comfortable and I always know where they are. - Being a shy person, these Red Glasses protect me. People look at my glasses, not at me! - Sometimes as a joke, I tell people, I don't wear glasses to see, but to be seen! Thank you so much Selima.